Writers: Jonathon Green and Anthony O'Connor. Cast: Nicholas Hope, Kelly Paterniti, Sam Reid, Alan Dukes, James Mackay, and Hayley McElhinney. 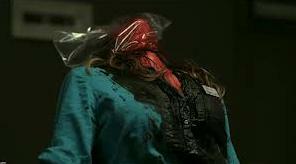 Redd Inc. is an Australian shot horror film, which was originally titled Inhuman Resources. This is truly an independent film, that was partially financed through crowd funding. Redd Inc. is also a tale of an office worker's worst nightmare. Thomas Reddmann keeps his five workers literally chained to their desks, while needling them to work harder. Shot primarily on one location, Redd Inc. can sometimes look drab, but the film's characterizations and especially the lead villain create for an exceptionally good time. Thomas Reddmann is accused of several axe-murders. Reddmann was able to escape the local mental rehabilitation unit, after he is found guilty. He puts his time to good use. Soon, Reddmann has abducted five characters, each of whom are involved in his case. 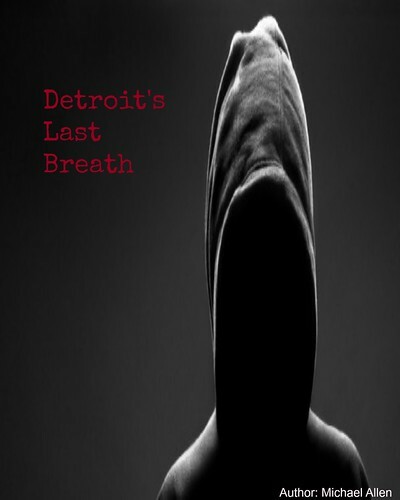 He sets them to work on his file in search of leads to the real killer. The five workers are motivated by fear. Reddmann kills a few people in his office, while scarring still more. Fortunately, the five office workers break the case and their chains. Redd Inc. was shot for a small budget and the script was devised to keep production costs minimal. Thus, the film is shot primarily in an old office building. One set is the focus of the film, with Redd Inc. opening itself up to exterior shots late in this title. This reviewer has a complaint. The primary set is gloomy. The darkness may or may not be intentional, but this watcher wanted a little more brightness. There are some well lit scenes late in the picture. So, the darkness of the first set is likely created for mood. Other sets come off as lighter, once characters escape their darkly lit confines. Those characters are what keeps this film so interesting. It seems that each character is tied in with Reddmann's case. One man, Edward (Alan Dukes), was the arresting officer. He catches Reddmann in an elevator, axe in hand. Annabelle (Kelly Paterniti), the protagonist, was a witness to some of Reddmann's supposed gruesomeness. Another man is Reddmann's former defense attorney. And, all of these characters have a connection to Reddmann, or a reason for their confinement. The best character in this film is, of course, Thomas Reddmann. Reddmann is played dynamically and malevolently by Nicholas Hope. This character is obviously psychotic, but he also seems highly motivated to solve his case. He dismembers or decapitates those who are less inspired. Thankfully, Reddmann faces an equally evil opponent in the film's climax and the villains in this piece keep the events onscreen tense and even darkly comedic, at times. 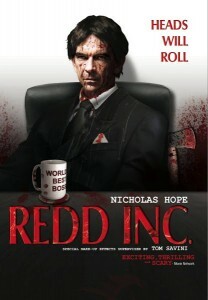 Redd Inc. has recently been released in some territories through a video-on-demand release and horror fans should seek this title out, where it is available. Redd Inc. is a smaller horror film, but it seems to rise above its simple material. There are great quips about office politics in this feature and the gore is sprinkled about liberally by make-up artist Tom Savini. This title is a blood-soaked wonder, that will still be unravelling in this critic's nightmares long after the credits have finished. Overall: 7.5 out of 10 (good writing, well written characters, compelling villains, solid tension, unpredictable, good twists, darkness can wear over time).